As someone who likes pretty spaces and lovely things, I would be happy to be uncomfortable to keep my home looking pretty. No I don't need to sit down or dirty a plate for lunch. I'll just be over here eating my pb &j over the sink, thankyouverymuch! My husband and kids? Not so much! The eye rolls and loud sighs show how much they care for my pretty things. So if your family is anything like mine, you have to balance pretty with functional. 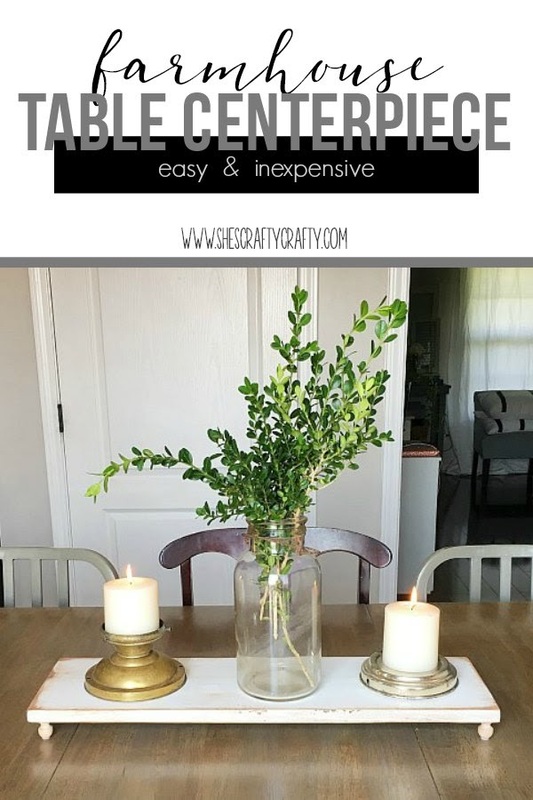 This Farmhouse Table Centerpiece does just that and it is easy and inexpensive too. It's the perfect project, really! 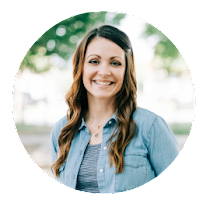 We eat at our table every single day- multiple times a day, in fact. Our table has to function! But with that function, I want something that is nice looking! I came up with a centerpiece that does both. 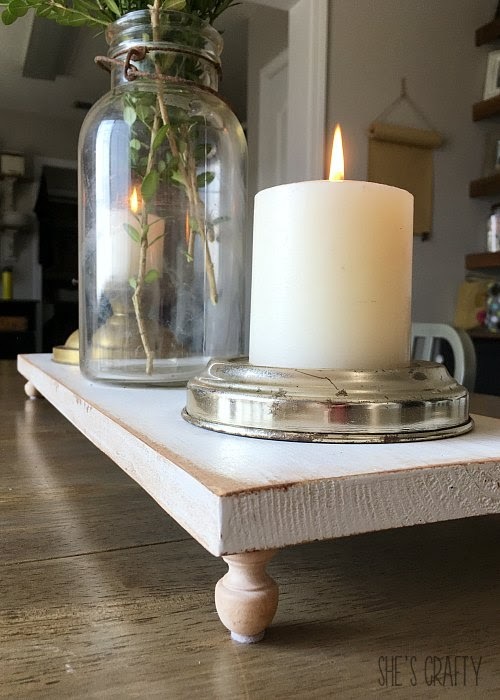 I reused a piece of wood that I found in my garage. 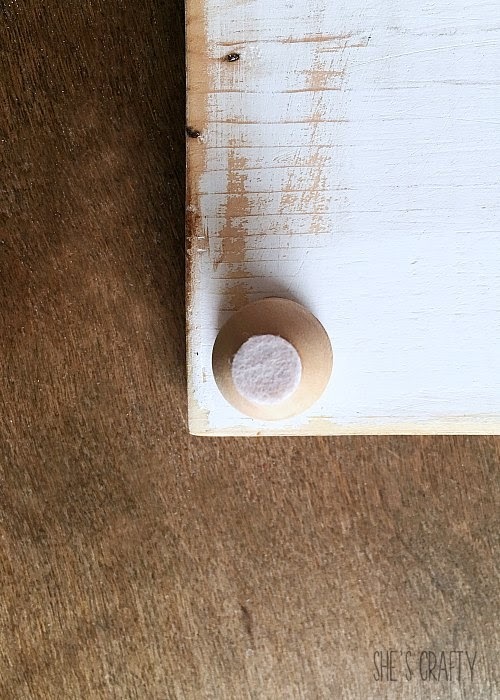 The wood was reclaimed from another project so it was already painted it white. I distressed it a bit with sandpaper. To age the piece, I rubbed on antiquing medium. 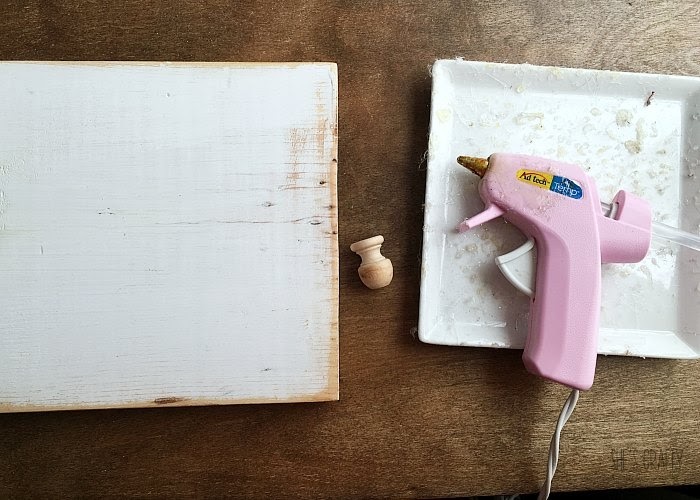 I applied it with a paper towel, then wiped it quickly with a wet paper towel. I like antiquing medium because it's water based and dries quickly. 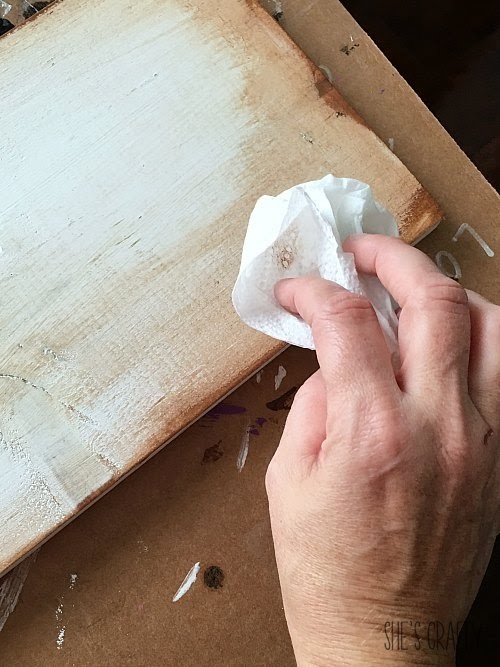 You could also use stain. 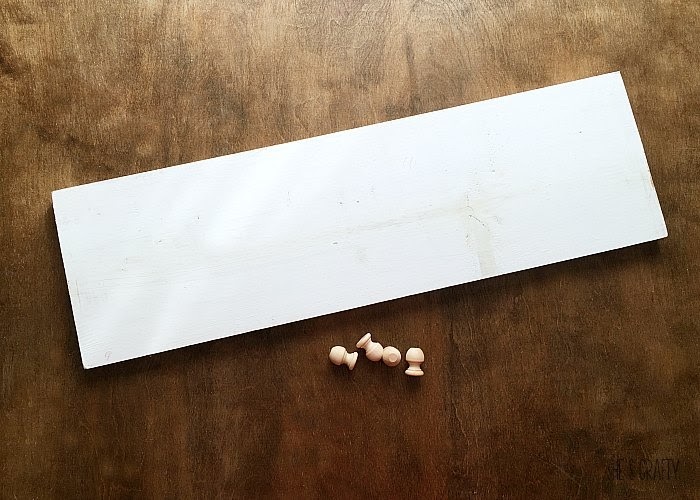 Hot glue finial pieces to the bottom of the wood to make feet. 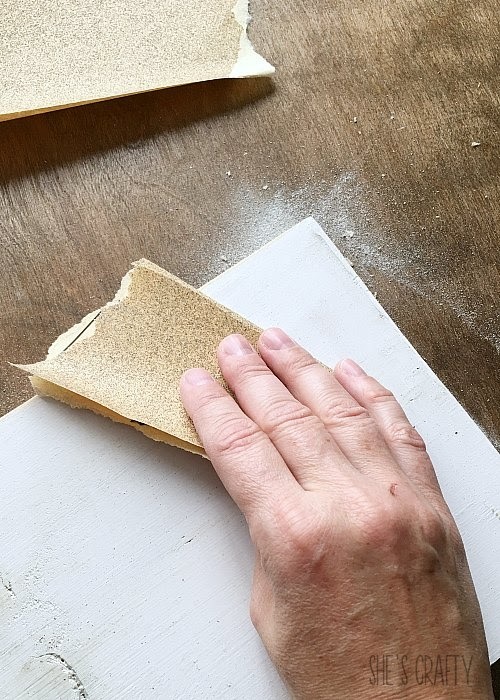 Apply felt bumpers onto the feet to protect the surface of your table. 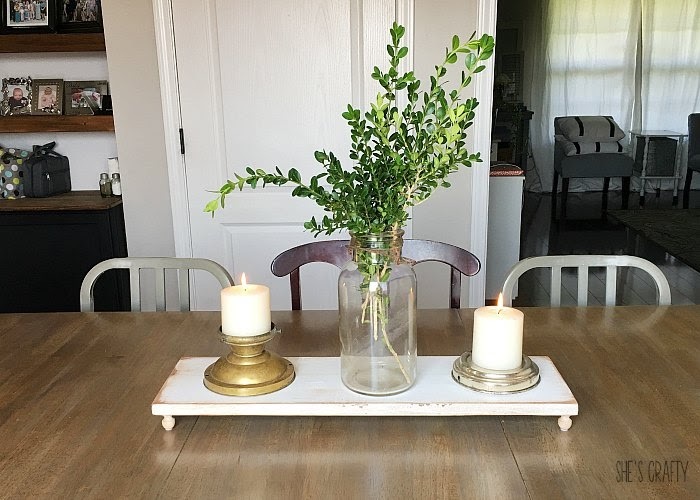 To style the Farmhouse Table Centerpiece, I put beautiful boxwood clippings from the bushes in my yard (that needed a trim anyway) in a vintage jar. 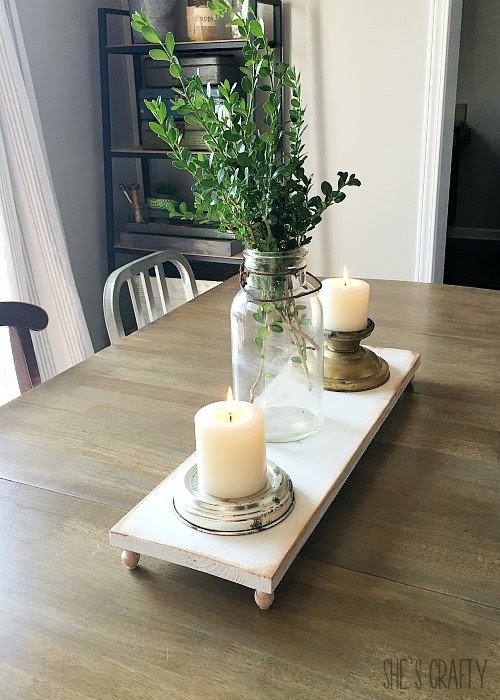 With the jar of lovely greens, I also used my favorite repurposed metal candle holders. 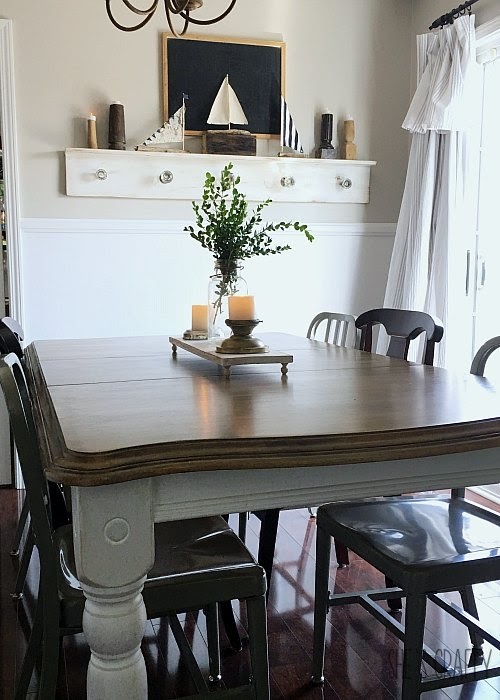 You really can't get much more farmhouse style than greens and repurposed items! 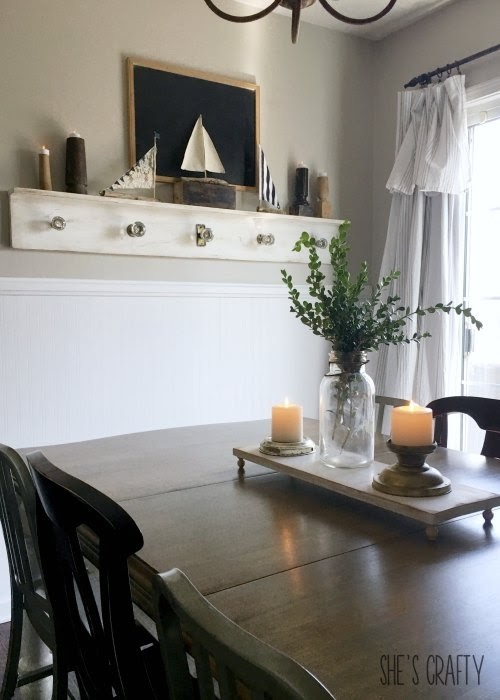 See a tutorial for the drift wood sailboats here. Those bumpers are perfect for protecting my table. I didn't Strip and Stain my dining room table just to have it get scratches all over it! 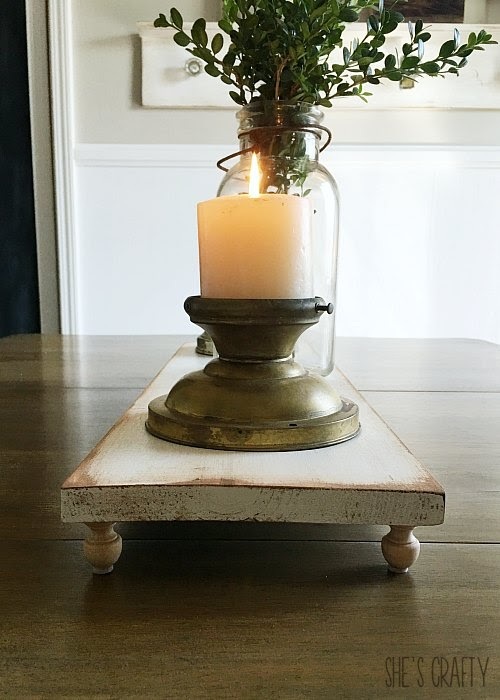 This simple Farmhouse Table Centerpiece is functional so my kids won't destroy it while eating yet pretty enough to leave in between meals! How clever! Simple and yet so classy.